Progressing from his series on maintaining the turtle, Dónal showed a simple option for moving to orthodox back control. You're behind them: on one side, you stick your arm in up to the wrist by their hip, where it stays in as a hook. Leave a leg behind on that side too, still tight to their body. Your remaining arm reaches for their arm on the other side, joined by your other knee. If there is space, you can just replace your forearm with your leg to insert your hooks. Note that for the second hook, you will have to turn your body before you can insert it, or you'll find the motion awkward. Pull them to to the side, rolling them over the knee you had on the arm-gripping side, ideally straight into back mount. You'll also want to establish a harness/seat-belt grip, with an arm over the shoulder and the other under the armpit. In specific sparring, I had a play with the back take I learned from Rickson, where he takes a leaf out of Marcelo Garcia's Advanced Brazilian Jiu Jitsu. 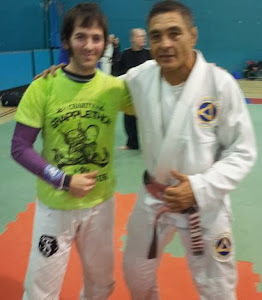 Just like Marcelo, Rickson showed how if you have that seatbelt, you can maintain the back even without having your hooks in place. If your opponent is in the turtle, you can simply establish your seat belt, then leap over and roll them into place. I managed it once or twice, but I need to be tighter. Also, this was against a beginner (he had some other grappling experience, but not BJJ).